A number of readers have been commenting on my blog about Tres Dias and similar Cursillo-based weekends. One of my major concerns with these weekends is ecumenism. A reader (Jeremy) pointed out that, on the plus side, some born again believers do attend these weekends; this affords them an opportunity to witness to unsaved attendees. I still have a problem with these weekends though, in spite of this. Read on. Readers may ask, what exactly is wrong with ecumenical ventures? Let’s take a look at the fruit. Many ecumenical ventures now seem to be morphing into interfaith ventures. Such ventures are extending the right hand of fellowship to Catholics, Jewish people, Mormons, Muslims, etc. Where is ecumenism and the interfaith movement leading us? Toward the One World Religion, I’m afraid. It still seems to me that separation (as much as possible) from all ecumenical ventures is always the best position for born again believers. So far, I have not heard of any ecumenical ventures where the born again attendees were able to bring significant numbers of mainline/liberal attendees to Christ. In many of the ecumenical ventures I’ve heard of, the opposite has happened – born again attendees and born again denominations have become more liberal. It seems to me many born again attendees are not well grounded in their own belief system. A similar scenario: born again kids going off to state universities and losing their Christian faith. If readers have heard of a truly “successful” Tres Dias weekend or other ecumenical venture (“successful” as in converting many non-born again attendees), I would be interested in hearing about it. This would be something to praise the Lord for – although as I’ve tried to explain above, I think the facts show that such a success would be the exception rather than the rule. What is a Unitarian Univeralist? Are Tres Dias and similar Cursillo retreats heretical? I say yes! Apparently there is some confusion as to whether three day retreats like “Emmaus Walk” and “Tres Dias” are heretical. I believe they are. Here we are going to look mainly at Tres Dias, but below you will find that Emmaus Walk and Tres Dias came from the same origin. These and other types of three day retreats are all part of the Three Day Movement, according to a Wikipedia article. Note – below I have emphasized certain points by bolding, and inserted comments in [brackets]. Below is an article by David Cloud I found a few years back. Unfortunately I didn’t save the link. Cursillo movements have been popular in Georgia since the 90s. “Walk to Emmaus” is part of the Cursillo movement and is usually associated with Methodist churches although people from various denominations attend. Tres Dias is another one. Recently, the Southern Baptist Convention (SBC) warned its members to be wary of the Cursillo-type movements, saying that such movements are secretive and divisive. SBC’s Tal Davis told Baptist Press that the focus of those who attend the Tres Dias weekend retreats “is no longer on the gospel or evangelism, rather the experience they’ve had” (BP, 12-29-99). According to Baptist Press, Davis has heard from a number of SBC churches who have reported problems as a result of the retreats. “Some church members have done extreme things, selling possessions, becoming secretive. It’s almost like the weekend retreat has become the focus of their spiritual lives,” Davis said. Paul Mason, pastor of Central Baptist Church (SBC) in Douglasville, Georgia, said those within his church who attended the retreat were secretly inviting others to attend. When he asked about the retreat, those who attended told him it was a secret and that they could not discuss what happened during the weekend of the retreat. Mason noted that “one area of concern is the potential for participants to manifest Charismatic tendencies” (BP, 12-29-99). Defenders of the Tres Dias and other Cursillo-type movements reject the notion that these movements are Charismatic and secretive. Wilson Burton, Jr., a member of a Church of Christ congregation and a member of Tres Dias’ international board, told Baptist Press that even though some who attend the retreats experience Charismatic manifestations ranging from laughter to healing, Tres Dias is not Charismatic. “It is an encounter with the Holy Spirit,” Burton said. “The ministry is ecumenical in nature and actively seeks the participation of persons from all Christian denominations” (BP, 1-18-00). He also told Baptist Press that Tres Dias does not preach one theology but rather stresses what all denominations hold in common. A careful look at the orientation, history and essentials of the Tres Dias movement, and other Cursillo-type retreat movements, reveals that such movements are unashamedly ecumenical in scope. One Baptist Press article noted that “Baptist, Lutheran, Church of God or Catholics, among others, may be represented on any given weekend” (BP, 1-18-00). Likewise, such retreats are often dominated by Charismatics within each of the denominations. No Bible-believing Fundamentalist should have any part of such a fellowship. Christian discernment articles exposing Cursillo, Tres Dias, etc. 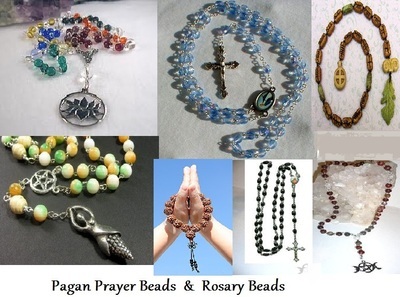 “Protestant” prayer beads/rosaries just as heretical, occultic and dangerous as the Catholic rosary, Hindu prayer beads, Buddhist prayer beads, etc. In recent years, a prayer tool called the “Pearls of Life” has become more common, particularly in the Emerging/Emergent Church movements. The Pearls of Life are an ecumenical Lutheran prayer beads/rosary. Unfortunately, the Pearls of Life (like every kind of prayer beads/rosaries) has occultic pagan origins and is used in an occultic contemplative way. 1) The Pearls of Life seem to be a Protestant version of the Catholic rosary (which is occultic and idolatrous). Many of the heresies of the Rosary will also be heresies of the Pearls of Life. 2) Both the Pearls of Life and the Catholic rosary involve ritual (which is occultic). 3) I assume the Pearls of Life, like the Catholic rosary, are viewed as a “means of grace.” They both involve salvation by works (people falsely believe they can get to Heaven by doing works). Let’s look at the invention of the Pearls of Life. I found the following excerpt here. Note – throughout this blog, I am emphasizing certain points by bolding, and inserting comments in [brackets]. “This site is about Pearls of Life – an ecumenical rosary from Sweden. For better description there is a basic book of Pearls of Life by Martin Lönnebo [if he is heretical, his invention the Pearls of Life will be heretical], which you can order from a Swedish Publishing company VERBUM. Martin Lönnebo, Lutheran emeritus bishop in Sweden, was considering what could help us in praying, what a person needs when he/she is distressed, how the church could support young parents to pray with their children… And he made a conclusion that a rosary could be a practical device for these purposes, and also a help in spiritual training [perhaps he was thinking of Richard Foster’s occultic Spiritual Formation], which he finds even more important than physical or mental training. The “Pearls of Life” (in Swedish, they are known as frälsarkransen, which means “the lifebuoy”) were invented by Bishop Martin Lönnebo of the Church of Sweden [in 1996]… Bishop Martin had long been interested in the spirituality of the Eastern Church and fascinated by the mixture of formality and informality in Orthodox worship, with its candles and icons and prayer beads, and he set about designing what became a “prayer bracelet”. After trial and error, he finally decided on a set of eighteen beads in which he summarised the message of the Christian faith. Bishop Martin wanted a tangible means of communicating that faith, and from his studies of eastern spirituality he knew something of the ways in which beads are used as aids to prayer in world religions. In Islam, a rope of 33 beads enables Muslims to focus their prayers on the 99 Beautiful Names of God. there are similar aids to Hindu and Buddhist devotion. In Western Christianity the Rosary holds pride of place. It has a whole literature devoted to it, mostly by Roman Catholic writers, but with significant contributions from Anglican writers such as Austin Farrer and from the Methodist Neville Ward. In the Eastern Church ropes of “prayer knots” are an aid for those who wish to fulfil St Paul’s injunction to “pray without ceasing” (1 Thessalonians 5:17), running through the rhythms of the Jesus Prayer. Martin Lönnebo’s “Pearls of Life” are very different from the Rosary. There is no single prescribed way of using them as there is for the Rosary. They are, Bishop Martin insists, “a lifebelt not fetters”. Those who have sufficient leisure can work their way in prayer round the bracelet. In other circumstances it may be more appropriate to focus on a single bead or group of beads. They aren’t only a way of praying. They can also be used as a framework for teaching. The beads can be linked to stages in the life of Jesus, as well as opening up Christian experience. In the Church of Sweden, and in North Germany, they are widely used as an aid to catechesis. Our partner diocese of Växjö (which is, incidentally, immediately south of Bishop Martin’s former diocese of Linköping) has used it for some years now as a basis for preparing young people for their confirmation. Their great advantage is that they are discreet, and they are portable. They can be carried in a handbag or a pocket or they can be worn, like any bracelet, on the wrist. So what is the problem with prayer beads/rosaries? The problem is, they are a contemplative aid. Thus all Christian-based prayer bead/rosaries are occultic. It doesn’t matter whether they are Catholic, Orthodox, Lutheran, Anglican or whatever – they all work the same way. To enter this “spiritual realm” [of Richard Foster’s contemplative prayer/contemplative spirituality] it is essential for the participant to empty the mind of all thoughts, as well as lay aside Biblical notions on sin, Jesus Christ, grace and salvation. There are a host of web sites aimed at Christians [there are more than 78,000 such sites on the topic]. Advocates suggest that instead of a “sacred word” you could use the Stations of the Cross as a labyrinth tool for prayer, or Anglican Prayer Beads. These prayer methods are closely akin to the Tibetan Buddhist Prayer Wheel [which can be purchased on line for $25 ~ free shipping]. Just think of it: For only $25 you can contact God! Through contemplative prayer in its various forms and practices we readily find the connection between Catholics, Buddhists, Lutherans, Moslems, Episcopals, Hindus and Evangelicals. See also this detailed Wikipedia article, describing the occultic, contemplative use of prayer beads/rosaries in a number of world religions. The book Praying with Beads by Nan Lewis Doerr and Virginia Stem Owens (pp. vii-ix) also discuss the pagan history of prayer beads/rosaries. Click here to read online. George Fox University is the most liberal/Emergent school in the EFCI (Evangelical Friends Church International). So I was not surprised to learn they had held an interfaith dialogue. Thank you, Ken Cook, for your excellent critique of what I consider an anti-christian event, held at what basically has become a heretical Emerging/Emergent New Evangelical school. When a pastor friend of mine told me that there was an interfaith dialogue at George Fox University, the local college, I was excited to go. I have read, studied, and listened to and about this type of thing, but never had attended one in the flesh. I figured it would be an eye opening experience. The Jewish Rabbi spoke first. I took notes. By no means is this a complete discussion or recounting, but rather it just hits the things that I felt were most noteworthy. He was discussing the Jewish “Master Story”. He said it was a story of the confronting of power and that the story was centered in Exodus and Numbers. He went on to explain that need to confront power (Pharaoh) and go to the promised land. The thing that really got to me was the Rabbi’s discussion extolling doubt as a virtue. He started of like this: “You know those tv preachers… I am envious of them, of their confidence.” *Audience has sporadic laughter and agreement*. He continued to expound on the idea of doubt is a virtue of faith. This idea was linked to the idea of a rabbi discouraging a non-Jew from becoming Jewish. It was a somewhat non-nonsensical argument in my mind. From a Christian perspective this guy was coming out of shallow left field. Doubt isn’t a virtue. Faith is. Nowhere in his presentation, which included a lengthy discussion of Jews seeking justice for the oppressed, was there anything about looking for a messiah. Maybe it is just my Christian perspective, but I thought that the Jews were still looking forward to the Messiah. How is it that we can have a discussion of faith and not mention Jesus the whole time. I wish that he would have answered the question: Who is Jesus to you? The Muslim speaker presented next. He opened up with a commentary on the moderators opening comments. He was focused upon this idea of justice, and how justice was missing from many of the presentations of this kind (speaking of interfaith discussions I believe). I found myself somewhat frustrated by this talk of justice by a Muslim. It was my belief that justice for this man meant something that is injustice from not just a Christian perspective, but from every other perspective represented there: namely, Sharia Law. I had stopped listening and my mind was flooded with the few specifics of Sharia that I knew and perhaps the only verse in the Qur’an that I know by heart – O you who believe! do not take the Jews and the Christians for friends; they are friends of each other; and whoever amongst you takes them for a friend, then surely he is one of them; surely Allah does not guide the unjust people. — Qur’an 5:51. So Here is a man standing before me who is preaching a justice that would mean my (and the rest of those present who were not Muslim) subjugation, oppressive taxation or death. My mind then went on to wonder how many people were actually understanding what he wasn’t saying here. How many people would understand that his concept of justice is in fact unjust. I came back from my thoughts, in time to hear him begin discussing how cartoons of the prophet are offensive. He explained that from the Islamic perspective all the prophets are to be respected. He then went through in Arabic some of the highlights of the OT prophets, asking the crowd if they could recognize which prophet he meant. Then he got to Isa. I knew I was about to be galled. The crowd of course didn’t recognize the name. He pressured them and finally told us that it was the prophet we would call Jesus; and that we got his name wrong. The smug arrogance of the statement was thick in the air. I could tell that many of the Christians had a deep disagreement and frustration by this statement, which was oddly encouraging that they seemed to take a stand on something. I would have loved to press this guy on this idea and on the concept that he actually respects Jesus as a prophet, given that he denies what Jesus taught. I get the feeling that he doesn’t understand that Jesus claimed for himself divinity ( John 8:48ff). He then went on to discuss Muslim prayers, something that I found interesting is that he said that you get more credit [with Allah] if you pray with at least one other person. The idea was that it was somehow a better work than simply praying alone. He then discussed heaven and how it is about having more good works than bad works. I was sure that his 15 minutes had elapsed at this point. He must have discussed prayer for another 5 minutes. He seemed to be winding down, with the concept of missionary work being offensive to Muslims. He said if you come to the poorest and dig a well that is good, but if you dig the well and “Bring your Christ” it is offensive. He made it seem like this type of thing is akin to taking advantage of the poor. With this he finished. I sat back thinking to myself how he really just didn’t tell the whole story. From my understanding, the concept here is that Jesus is not God in Islam. That to come and preach that Jesus is God is what is offensive to the Muslim. They need us to do these things for them, but don’t want Christ preached beyond what the Qur’an says about him. Here is the problem: The Message of Christ is Offensive. ( cf. Gal 5:11, 1 Pet 2:8, Rom 9:33) I know this may come as a shock to you — the Gospel of the crucified God-Man Jesus Christ is just as offensive to the Muslim as it was to the Jews and Greeks. One might think that I am a bit off the reservation with the whole justice and Sharia law issue. After Mr. Ahmed’s presentation, I went up to him and asked him if he felt that Sharia law was perfectly Just. His answer was no surprise, he said that it was absolutely just. I would assert that any man who consistently holds to that position, and believes that such a law should govern any land, can never ultimately have religious agreement with a non-Muslim. The difference in concept of justice is so definitively separate. To be clear, that doesn’t mean that he will be violent, abusive or destructive to those of another faith. Mr. Carlson Spoke after the break. I am not really going to say much about his presentation, for two reasons. 1. Buddhism as a non-Abrahamic faith would require a lot of explaining and 2. Given that he holds to a non-theistic view of Buddhism, the specifics don’t matter as much as the general theism issue in my mind. He is simply an Atheist with an Eastern philosophical-religious system at the end of the day. I believe he should be addressed as any atheist would. I would say that if we are offering up a gospel different from what Paul dictates for us in scripture, we are in serious trouble. But even if we or an angel from heaven should preach to you a gospel contrary to the one we preached to you, let him be accursed. As we have said before, so now I say again: If anyone is preaching to you a gospel contrary to the one you received, let him be accursed. 1 — in my later call with Sarah, she clarified that the gospel isn’t “whatever you do for the least of these,” and she described the gospel as what I would call the Eschatology of Hope, the good news of resurrection and the kingdom of God becoming present. Many wonderful discernment individuals are exposing the heresies of postmoderns (the Emerging/Emergent/Emergence church movements). One of these discernment individuals is Don Boys, Ph.D., who has written an excellent 12-part series of articles exposing the Emergent Church Movement. Dr. Don Boys is a former member of the Indiana House of Representatives, author of 13 books, frequent guest on television and radio talk shows, and wrote columns for USA Today for 8 years. His most recent book is ISLAM: America’s Trojan Horse! These columns go to over 11,000 newspapers, television, and radio stations. His websites are www.cstnews.com and www.Muslimfact.com. Don Boys, Ph.D. is an Independent Baptist evangelist now living in Ringgold, Georgia. He spent 30 years in Indianapolis as an evangelist, Administrator of the Baptist Academy, author, and member of the Indiana House of Representatives. He and his wife, Ellen (who sings in his meetings) do family conferences, revival meetings, child rearing conferences, creation conferences across the nation and in many foreign countries. And click here for a much longer biography of Dr. Boys. 1) What is Emerging From the Emergent Church? The Emergent Church heavily promotes many pagan and heretical practices although its adherents profess to be “evangelical.” They may possess a desire to move the world but they are moving it in the wrong direction. 2) Scriptural Truth is Unimportant to Emergent Churches! Some of the Emergent leaders… …have led the nebulous movement into deep, stagnant waters of heresy; but then that has always happened when a person, church, college, or a movement gets away from the Bible. 3) The Emergent Church Runs Away from the Bible! Emergent Church leaders ask the same question Satan asked in the Garden, “Hath God said?” They have no confidence in the Word so they have no compass, chart, or anchor. In my opinion, they are not even on the Boat! 4) Emergent Churches Are Kingdom Builders! 5) Emergent Church Leaders are Modern Gnostics! Emergent Church leaders denigrate sin, the savior, and salvation via the cross of Christ. 6) Emergent Church Teaches Everyone Goes to Heaven! Emergent Church leaders’ distaste for absolute truth and their desire for embracing everyone have led many of them into the heresy of universalism—everyone will go to Heaven. 7) Pagan Practices Taught by Emergent Church! God warns us in Jer. 10:2, “Learn not the way of the heathen,” but heathenism is exactly what EC leaders are teaching. 8) Top Agenda of the Emergent Church: Social Gospel! Emergent Church leaders are into the social gospel of the early 1920s, a failure and departure from the Word now as then. One of the EC leaders admitted that the EC is a protest movement, so what do they protest? 9) Emergent Church: Wacko Environmentalism Not Evangelism! There can be no argument the EC leaders emphasize the environment over eternity. 10) The Emergent Church Teaches One World Religion! 11) Emergent Church Leaders: Wolves in Shepherds’ Clothing! 12) Emergent Church: Top Evangelicals Like Dr. Dobson Huddle with the Hares and Hunt with the Hounds! It is obvious that many evangelical leaders do not want to be “put on the spot” especially when they are asked to take a position that embarrasses their friends or supporters. When addressing evangelicals, Emergents like Brian McLaren and Leonard Sweet discuss topics like ecumenism, Catholicism, and “big tent Christianity.” Yet elsewhere they reveal their true goals, openly endorsing the Interfaith Movement/Interspirituality and the One World Religion (which will eventually become the one world religion of the Antichrist). Demonically deceptive. Step 2) Introduce evangelicals to Spiritual Formation. Specifically, the discipline of contemplative prayer – which technically is not prayer but occultish contemplative spirituality. Richard Foster, influenced by “Catholic Buddhist” Thomas Merton and others, built upon the writings of the devotional heretics mentioned in Step 1 above, popularizing his unique occult perversion of biblically sound prayer practices. Step 3) Introduce evangelicals to the contemplative practices and sacraments of Roman Catholicism specifically. Persuade evangelicals to accept Catholics as being “born again Christians” (even though, in reality, Catholics hate the term “born again”). Bennett apparently is contending that McLaren’s goal in pushing Catholic contemplative practices and rituals on evangelicals is not Catholicism itself, but Eastern mysticism, aka occultish contemplative prayer/ contemplative spirituality). Step 4) Introduce evangelicals to the contemplative practices of other religions as well as the New Age movement (labyrinth prayer, for example). Step 5) Introduce evangelicals to the Interfaith Movement/ Interspirituality. Several examples: The Taize pilgrimage and the Wild Goose Festival. Note – the “theology” of the Interfaith Movement is very similar to the “theology” of Unitarian Universalism. At first evangelicals were fellowshipping with Catholics. Then we made the interfaith jump to establish ties with Jewish groups as well. Now we are dialoguing with Islam organizations. What’s next? Buddhism, Hinduism, etc. etc.? Unfortunately, according to End Times prophecy, this is coming. Step 6 Introduce evangelicals to the teachings of Brian McLaren, Leonard Sweet, Phyllis Tickle and other Emergent/ Emergence leaders regarding the One World Religion (which will eventually become the one world religion of the Antichrist). The Emergent Church Teaches One World Religion! ADDENDUM – Involvement in the Interfaith Movement by Roman Catholics, Evangelicals, etc. Personally, I do not believe postmoderns (Emerging/Emergent/Emergence leaders) are pulling us back to a pre-modern form of Roman Catholicism. That being said, it’s actually a win-win situation for postmoderns to push Catholic contemplative practices and sacraments on evangelical denominations. Why? Because Roman Catholicism itself “ain’t what it used to be.” As you probably are aware, there is a huge emphasis at the highest level of Roman Catholicism on the Interfaith Movement. Click here for the source of the above collage. Also, for Windows users – if you would like to zoom in on the above collage, click CTRL-PLUS on your keyboard (and CTRL-MINUS to zoom out). I believe many of the evangelicals currently falling into apostasy will ultimately follow the one world religion of the Antichrist. So what are the stages of this ultimate apostasy? 1) Separatist fundamentalists (they don’t like to use the term evangelical). These are born again, biblically sound Christians who have not compromised with the world or with heresy. I consider myself as belonging to this group. – Eric Barger’s article about Brian McLaren teaming up with New Agers (Eric Barger refers to the coming one world religion in this article). Actually, many Emergence leaders are even more openly New Age than Brian McLaren – Phyllis Tickle and Richard Rohr for example. 8 ) One World Religion – with a strong emphasis on New Age spirituality, a theology very similar to Unitarian Universalism, and Satanic/Luciferian worship. I believe the Satanic/Luciferian worshippers will be growing in strength and number, but for the most part lurking in the background at this point. There will still be groups on Earth that are resisting the One World Religion – such as separatist fundamentalist Christians (group #1 above), the Amish, “fundamentalist” Muslims, etc. I assume there will also be additional religious groups that will refuse to join the one world religion. – One of many articles by Berit Kjos on these subjects. She has written many articles about the New Age movement, the United Nations, the New World Order, the coming One World Religion, etc. Of all the End Times articles I’ve read, I would say the articles by Berit Kjos are the most thoroughly researched. 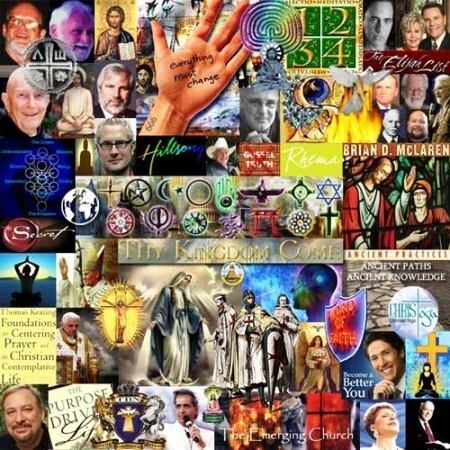 – A “heavy” Christian article about the Lucis Trust, the United Nations, the New World Order, etc. Check out the accuracy of the links yourself if they sound too “off the wall.” Like I said, it’s a “heavy” article. 9) One world religion worshipping the Antichrist – I believe this one world religion will be purely Satanic/Luciferian; all New Age and Unitarian Universalist teachings will be absorbed into this Antichrist religion. Satan wants to be worshipped as God. So when the Antichrist takes charge, he will become possessed by Satan. When the world is worshipping the Antichrist, they will also be worshipping Satan who has possessed him. Many religions believe in a coming “Messiah” figure. Of course they refuse to believe in the Second Coming of our Lord Jesus Christ. Yet they will have no problem accepting – and worshiping – the false Messiah, the Antichrist, when he comes on the scene. All those still on earth who refuse to worship the Antichrist will be “eliminated.” Those of us who went through World War II should have no problem envisioning the rule of the Antichrist. Simply imagine a Hitler (incredibly more Satanic than the World War II Hitler) ruling the entire world. All nations will ultimately answer to him and bow to him. This “world-Hitler” will at first seem to provide the answer to all the world’s problems. Then he will turn against the Church (whatever Christians are on the earth at the time) and the people of Israel. When this “world-Hitler” declares himself as “God” (II Thess. 2:4), his worshipers will eagerly carry out the ultimate holocaust, far, far greater than that of World War II. This will be a persecution that has never been seen before, nor will ever be seen again (Matt. 24:21). Does all this (or even part of this) sound far fetched to you? Let me just say this. Even Christians experience something called “cognitive dissonance” when they read about biblical prophecy and future events. They believe, in a general sense, that we are approaching the End Times. Yet when presented with documentation that we are closer to the End Times than they ever imagined, many laugh in disbelief. They view various articles about the End Times as being paranoid, full of conspiracy theories, off the wall. I admit, there are many articles that are not well researched and are off the wall, but many others are spot on. We are getting closer and closer to the End Times. Looking at the steps to apostasy above, we already see step #7 (the Interfaith movement) in the world today. And yes, evangelicals are getting involved in the Interfaith movement. And when these things begin to come to pass, then look up, and lift up your heads; for your redemption draweth nigh (Luke 21:28, KJV). "Harbinger" author Jonathan Cahn: who is he, what does he believe, and is he heretical? Who is Congressman Tim Ryan, and why is he pushing New Age/Buddhist "mindfulness" in public schools? "Fundamentalist" [Baptist, etc.] schools: which are still TR/KJV-only? Stand Up for the Truth!